How do your contract rates compare? Join our Benchmarking Club and confidentially compare your contract shipping costs against your peers based on shipper-only, buy-rate comparisons. What does 2019 hold for the container port industry? 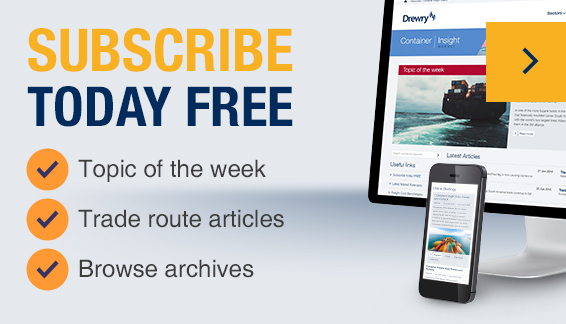 As the new year comes in, here are some thoughts from Drewry on what the key issues and trends will be in the container ports and terminals sector in 2019. The rush to catch up with container equipment demand following the shortfall of 2016 has largely played itself out, with 2018 promising to be a year of record production. Setting the standard for quality market insight and advisory support. Our container shipping practice is widely respected in the industry. These sector specialists manage one of the most comprehensive sources of container shipping market data and freight rate benchmarking intelligence available. A diverse and elite group of industry stakeholders from shippers to carriers, port authorities, investors and financial intermediaries rely on our research resources, sector expertise and commercial experience to help inform decisions, reduce costs and drive performance improvement. Our consultants regularly advise shipping lines on new trade lane market opportunities, review business plans for lenders, provide vessel investment appraisals to investors and commercial due diligence for container lessors. Meanwhile, our financial research specialists provide actionable insight on the top container shipping lines and equipment manufacturers. Whether you're seeking market forecasts, intelligence on benchmark container freight rates, historical data or a reliable appraisal of current market conditions, we have the breadth and depth of sector expertise and experience to meet your needs. The client wanted to evaluate the readiness of the container freight industry to adopt a value proposition for procure-to-pay automation that incorporates core Mastercard benefits such as payment guarantees. Drewry Supply Chain Advisors was selected to manage the 2016 global ocean tender for a US-headquartered global producer of technology products combining procurement best practices, the latest technology and freight cost benchmarks in Drewry’s e-Sourcing Ocean Freight Solution (eSOFS). We can support your strategic, operational planning and investment processes through the provision of tailored market analysis/appraisal, operational and technical due diligence services. As well as these we conduct market entry, feasibility studies and financial modelling exercises for shipping lines and owners, port authorities and terminal operators, government agencies and other organisations with interests in the container shipping sector. How do your container shipping costs compare with your peers...? Our Benchmarking Club allows participating members to confidentially benchmark their contract shipping costs against their peers based on genuine, shipper-only, buy rate comparisons. Combine benchmarks and market intelligence with unique rate forecasts to maximise your procurement results. Widely regarded as the go-to reference for the global container industry, this product provides comprehensive market forecasts and analysis for container trade and port volumes, global supply and demand, trade route analysis and much more. All quarterly report updates are accompanied by tables, charts and graphs in MS Excel format.